Chivas Regal chose the Verderflex DURA for its suitability for dosing abrasive and viscous fluids, and its need to minimal maintenance. Whisky manufacturer Chivas Regal, part of the Pernod Ricard Group, has selected the Verderflex DURA 10 peristaltic hose pump for a water treatment application at its Glenlivet plant in Scotland. This distiller cites this model’s proven suitability for dosing abrasive and viscous fluids, and its need for minimal maintenance as the principle reasons for its choice. At Chivas Regal, the DURA pumps are employed for lime dosing, an application for which this model is ideally suited. Used to rectify the pH of waster discharges, lime is highly abrasive, creating continual wear problems for progressing cavity pumps. This leads to ongoing high stator replacement costs and frequent maintenance downtime. Lime is also relatively viscous, indeed generally too viscous for diaphragm pumps, causing them to clog up and become highly maintenance dependent. The Verderflex DURA is abrasion resistant and ensures the smooth passage of the liquid regardless of its viscosity. Its design also presents no opportunity for the product to settle as the peristaltic action keeps the product in suspension. Furthermore the product can be mixed on site as solids in the liquid stream do not present a problem for the pump. It also has a linear flow-speed characteristic that is ideal for feedback control systems, allowing precise control of the chemicals being dosed and minimising chemical usage. The Verderflex DURA has a drive configuration which provides a 70% smaller footprint to similar pumps. DURA offers greater reliability over other pumps due to its rigid drive connection. The rotor is mounted directly over the bearings, so there is no overhung load, further reducing the number of parts. The rotor has been designed so it requires no shims, simplifying installation and reducing DURA’s overall power consumption. As the DURA runs at a significantly lower operating temperature than equivalent pumps, hose life is improved by up to 40%. Another contributor to its longevity is the custom engineered construction of the Verderflex hose. This increases strength in the reinforced layers between the rubber and maximises the fatigue strength. In combination with the advanced rotor profile, the superior hose design ensures greater up-time of the pump. The bearing construction is sealed for life and centrally absorbs the forces released in the pump. This results in quieter operation and a more durable pump and drive. 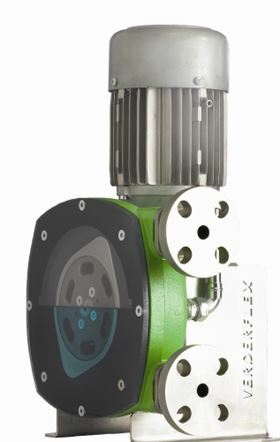 Other features specific to this pump include an improved frame design and a one-size-fits-all slotted flange to connect the pump to the pumping station. The entire DURA range incorporates a rapid change taper-lock flange that is suitable for pressures up to 12 Bar/175 PSI.